Last month, I blogged about Geoffrey Wellum's extraordinary account of his part in the Battle of Britain in a book called First Light. You might remember that I was so incredibly moved by his story that, having had permission from his editor at Penguin, I wrote him a letter thanking him for his service to his country and his heroic actions. What I didn't tell you, however, is that I received the above reply, only two days later. To say it made my day is the understatement of the year. I saw the envelope on the floor when I returned home that evening and thought the handwriting looked familiar - that is, of a friend's. 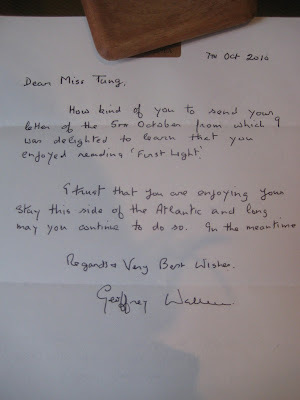 When I opened the letter, however, I literally jumped around the flat with joy - this man is a legend! I was so glad that he received my letter of thanks and thought it was so kind of him to write back. If you haven't already been persuaded by my previous recommendation, do go and buy it now - or I will be happy to send you a copy. Without sounding trite, it's a book that will stay with you forever, regardless of your interest in the Second World War or fighter aircraft. Yep, I ordered Ten Fighter Boys (a collection of first-hand accounts taken from ten Spitfire pilots, not all of whom, sadly, lived to see the end of the war) shortly after finishing First Light. Spitfire, below, is a coffee-table-type reference book entirely devoted to the Spitfire airplane, which I randomly found at a garden center, of all places (by 'random' I mean I accidentally wandered into the books and gifts section of the center and, upon spying the book, hysterically ran up to John, tapped him on the shoulder and shoved the book into his face with undue excitement before racing to the counter to buy it. And yes, I searched for Geoffrey Wellum's photo as soon as I got in the car, and yes, he is in it, although not mentioned by name). srsly, u are sooo obsessed with Battle of Britain books. but they are sooooo kyute! who are you and what have you done to my BFF.